after reading tom waits on waits, a book of his interviews, i found some audio that was recorded at KCRW. 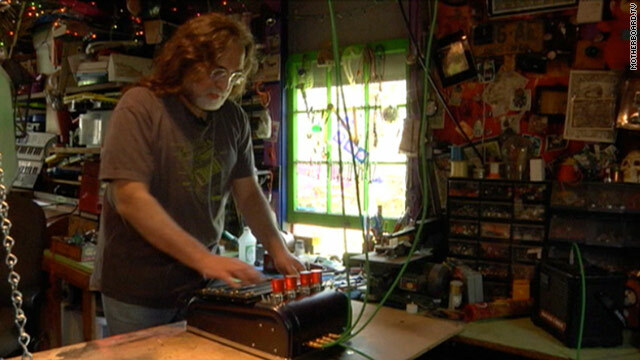 this little snippet is where waits is talking about reed ghazala, the father of circuit bending (pictured above). the thing he’s describing is an optical theremin, which was the first instrument that i debuted in my 2011-2015 sidewalk noise experiment better known as mondo beep. looks like a cash register? oh shucks, I thought you were original. As far as I’m concerned, son, you are the inventor of all that stuff.Everthing I heard on that interview I know I heard you talk about doing or planning. All you have to do now, as far as I’m concerned, is go back and tweek whatever you want to of what you’ve done, and that should last you a lifetime. But Dave draws the line at cat oil. He will NOT trade goods and services for cat oil!